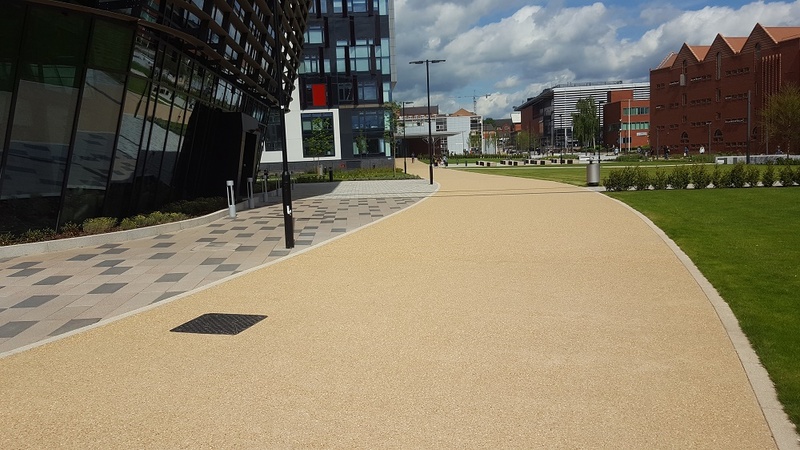 Aggregate Industries has supplied a mixture of concrete and gravel aggregate for De Montfort University (DMU) to remodel and landscape Mill Lane, the main thoroughfare in the heart of the campus. The contract, awarded by Balfour Beatty, saw Aggregate Industries supply concrete for the development, which has created a visually impressive area of public paths and seating in the main area of the university. The Mill Lane remodel, which was completed by Aecom Landscaping, a leader in beautiful, contemporary landscape architecture, required 400m3 of Artevia colour concrete, and golden gravel aggregate, to create a visual and structural layer design. Artevia was not only selected as a complimentary product to enhance the ‘streetscape’ design pallet, but it offered the necessary durability required of a concrete being used in a heavily foot trafficked environment. To meet the expectations of DMU and Leicester Council, Aggregate Industries worked in partnership with Aecom Landscaping to help design the slabs for the development at every stage of the process from concept to installation. This included the specification of bespoke concrete mixes, logistical planning to acquire the highest quality materials to optimise the aesthetics and onsite technical support during the installation of the ensuring the chosen material would deliver an aesthetically pleasing construction. Aggregate Industries’ Artevia, is the perfect material for projects like Mill Lane, making it possible to create different visually appealing design textures and colours, and contrast with other materials or surroundings. It is low maintenance, and naturally slip and skid resistant, making it ideal for busy thoroughfares such as a university campus.